Публикувахте от LUST в Петък, 24 март 2017 г.
Публикувахте от Experimental Music Catalogue в Петък, 24 март 2017 г. Evening concert, MTI Goes EMC²: Students and staff from DMU’s music technology department play music. Panel Chaired by Sarah Walker, including Virginia Anderson, Chris Hobbs, John White and Hugh Shrapnel. Публикувахте от Experimental Music Catalogue в Събота, 25 март 2017 г. Video awaiting processing, so we’ll have to wait for good quality clips, and for Howard Skempton’s In Tandem, performed by Antony Clare and Mick Peake. We're hoping to bring you not only the talking portion of the EMC2 weekend, but also audio and perhaps video records of these historic concerts. In the meantime, here are a few clips from the lunchtime Keyboard Experiments concert: first, a few seconds of Chris Hobbs, premiering the first solo version of his Cold Blue Sudoku 82. Публикувахте от Experimental Music Catalogue в Неделя, 26 март 2017 г. We're hoping to bring you not only the talking portion of the EMC2 weekend, but also audio and perhaps video records of these historic concerts. In the meantime, here are a few clips from the lunchtime Keyboard Experiments concert: Here is Hugh Shrapnel and Sarah Walker performing Hugh's Ladywell Station. We're hoping to bring you not only the talking portion of the EMC2 weekend, but also audio and perhaps video records of these historic concerts. 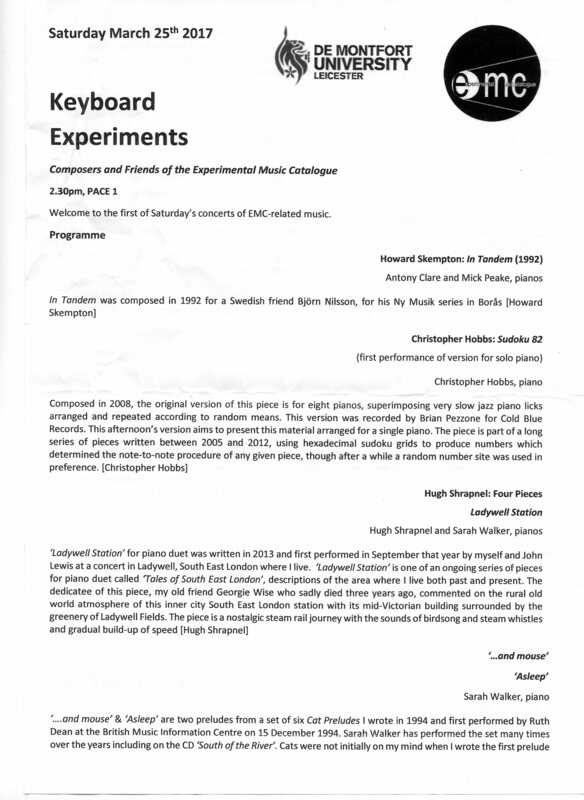 In the meantime, here are a few clips from the lunchtime Keyboard Experiments concert: Sarah Walker playing "…and mouse" from Hugh Shrapnel's Cat Preludes. We're hoping to bring you not only the talking portion of the EMC2 weekend, but also audio and perhaps video records of these historic concerts. In the meantime, here are a few clips from the lunchtime Keyboard Experiments concert: Hugh Shrapnel playing his Nocturne. We're hoping to bring you not only the talking portion of the EMC2 weekend, but also audio and perhaps video records of these historic concerts. 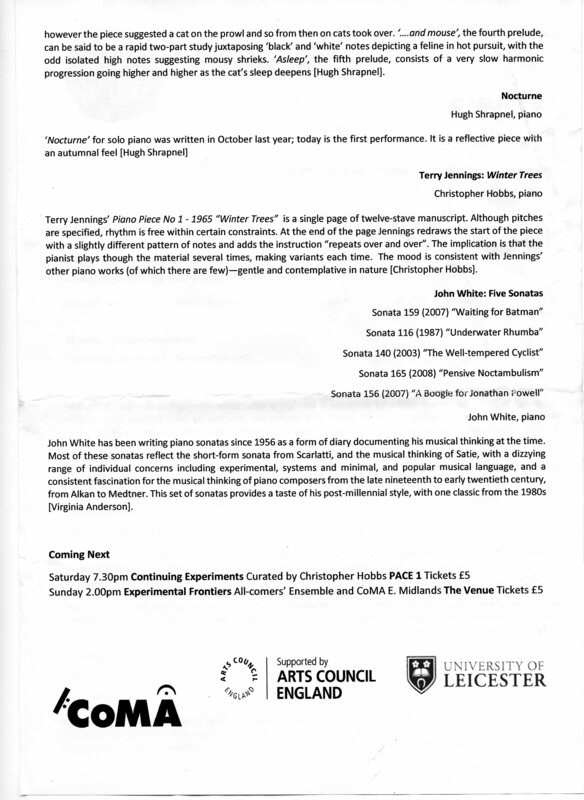 In the meantime, here are a few clips from the lunchtime Keyboard Experiments concert: Chris Hobbs performing Terry Jennings' Winter Trees. We're hoping to bring you not only the talking portion of the EMC2 weekend, but also audio and perhaps video records of these historic concerts. In the meantime, here are a few clips from the lunchtime Keyboard Experiments concert: John White performing his 2007 Piano Sonata 159, "Waiting for Batman". We will get to the evening concert, Continuing Experiments, in another post.